Second day for me in the Make Something Cool Every Day challenge. 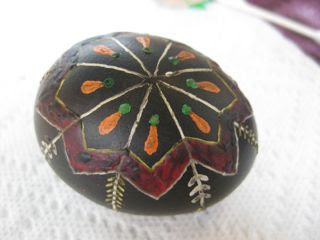 Today I went to a crafting workshop and learned how to make Pysanky (or Ukrainian Easter Eggs) The class was offered at the Wistariahurst Museum (which is a gorgeous historic mansion) and was taught by a wonderful woman, Carol Kostecki. This was probably one of the best classes I've ever taken- It was so much fun! 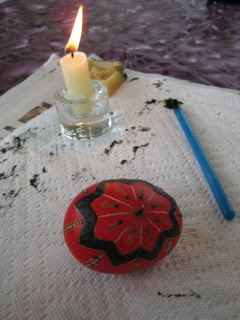 Over the 4 hours we each decorated our own egg (we all did the same pattern) step by step. Here are the first wax lines. These will stay white once the egg is all done. 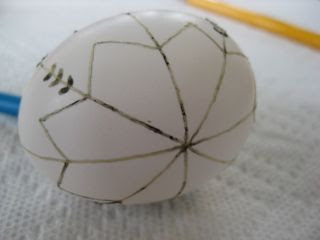 After drawing the wax lines the egg was dyed it's first color. Here it is after I put the egg in yellow. I drew tear drops, then dipped it in red. I filled in the star pattern- so this part will stay red. 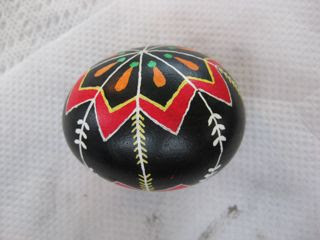 Then the egg went into black- the final color. After I melted off all the wax- the layers of color were revealed! 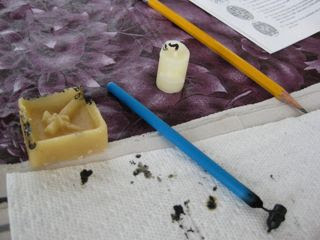 This was the best part, seeing all the colors appear as the wax melted off. 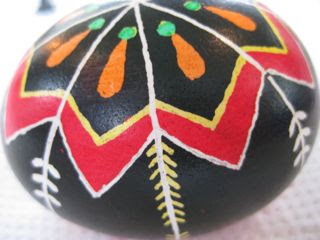 Traditionally the pictures and colors have meaning. 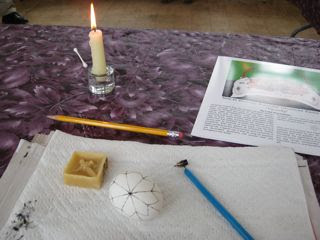 The pine needles symbolize youth and health, and yellow means fertility. 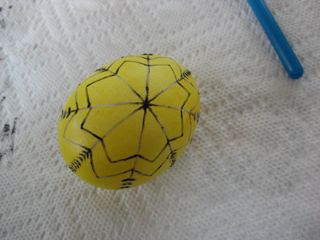 I love to decorate Easter eggs but have only every used a basic kit from the grocery store- this was so much more satisfying! The egg turned out better than I could've ever expected. 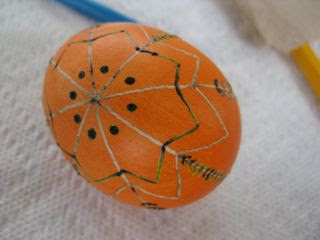 And I was pleasantly surprised by how easy it turned out to be- the eggs look so complicated (and some no doubt are) but this pattern and technique really was easy once it was broken down into steps. 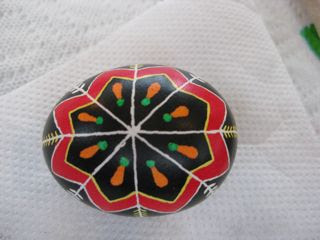 Carol brought some examples of her own decorated eggs that were incredible (and way more difficult). I could totally see myself doing more of these...we got to keep the stylus (called a kistky), wax, and instruction booklet so all I need do do is order dye and I'll be able to try my hand at a few more designs. I know that yesterday's MSCE post was about eggs too, but hey it's April...and maybe I'm on an egg kick. I still have my grocery store dye kit to use so there's at least one more egg post to go! Is the egg shell drained so that you can keep it, or is this like a traditional Easter egg where you will peel and discard all of your beautiful work? I'd love to see more when you have made them! Thanks for becoming a follower! I've also checked out your blog through the dabbled link and will be checking your blog for more posts too. 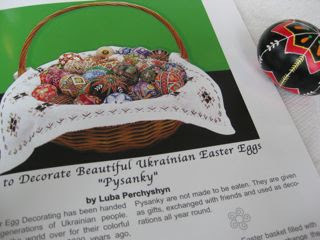 This egg isn't blown out, it's a whole raw egg which is apparently traditional for pysanky. The workshop instructor told us that you can either blow the egg out or use a whole raw egg, but that we'd be using whole eggs. You keep them and (this sounds so gross) in 3-4 years the inside of the egg will have completely dried out. It doesn't smell spoiled or anything, unless it happens to crack (she also said not to keep them in a glass case while they dry out because they would crack). If they were hard boiled eggs they would spoil so they have to be raw. 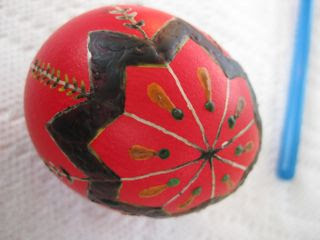 These use a non-edible dye, but If you wanted to use this technique for Easter Eggs to eat you'd could use a food coloring kit instead. 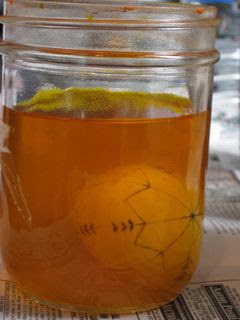 If you want an egg to keep as a decorative object you can't use a food coloring kit because the dye will fade over time. Love it - I made these as a kid with one of my friends. I would love to try it again, maybe when my kids are older. I think I still have an egg that I made 20 years ago and it was just a raw egg. After awhile when you could hear the solid yolk inside. Pretty gross but it never smelt. Now I'm wondering where it went. I linked to this on dabbled's easter roundup today. Nice tutorial!